Wait, You Have Another Dog? What do you mean I have another dog? I mean, haven’t you heard enough about my miniature horse-dog that you thought…what gives? Another dog? Weighing in at a SOLID 9 pounds, with 90 pounds of macho included – is Ralph Thomas. All chiahuahua, brown and tan fuzzy fantasticness. I got Ralph when he was a puppy, and he’s now my little four year old puppy still. He “owns” Penny every day. I get home, Ralph tells her where to go, when to get there and seems to thoroughly enjoy making sure she knows which toys (all of them) are his. He sleeps in my bed with me. Sometimes he stares down at Penny as if to say “HA!”…but nonetheless, makes himself at home on a big pillow. I’m rather convinced he likes Frasier and Diners, Drive-Ins & Dives – he seems to watch them very contentedly. Ralph’s got an open fontanel on his head. This is an opening in his skull similar to a baby’s soft spot. While it’s gone unconfirmed, I’d like to think that his brain is so smart, that it sorta pushed out of the space it was given. That said, he is a pretty smart cookie. He knows sit and down and roll over. Well…if roll over means to touch your back to the floor while still maintaining some odd state of uprightness…it’s very odd, but every now and again, gravity takes over and he actually flips himself over as the trick dictates. He loves.LOVES.loves.lurves. Ritters Frozen Custard. He knows what the container is. While I’m not a big fan of giving your dog table scraps, some how this little devil got a taste and well, since then, just entering the house with the all-telling Styrofoam cups sends him into convulsions. Lately he’s been suffering from luxating patellas. This is where the knee caps make little popping noises as they move in and out of joint. While it sounds painful, and he’s hurt himself a few times jarring it jumping off and on things, he’s pretty normal. It’s just a sign that my little man is aging, which pulls at my heart strings. I adore Ralph. 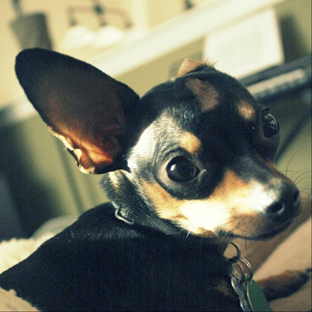 While I’m not always the biggest supporter of everyone getting a Chihuahua – they do take a special breed of person to do it – I definitely support that this little guy has won a huge spot in my fuzzy family – despite his miniature size.